Distinctively engraved, beautiful satin finished brass plates. Letters are oxidized black. Custom cut sizes up to 8″ x 12″ for use as memorial plates, or for use on doors, cabinets, etc. 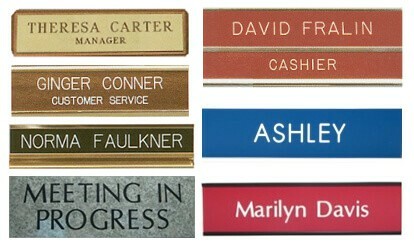 Brass plates can be attached to a solid wooden desk block to provide a name plate with a touch of class. 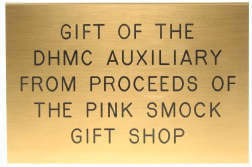 Small ornamental brass plates are perfect for use on picture frames, shadow boxes, display or presentation cases. We have several stock sizes. NOTE: The types of brass plates shown on this page are not recommended for outdoor applications. Traditional two color engraved plates for desks, counters, cubicles, offices, walls and doors. Available in both plastic and brass. Several finishes to choose from including matte, satin, textured, woodgrain and metal. Many letter styles/fonts to choose from or provide us with your own true type font. A wide selection of holders and attachments are available to finish the look. Individually engraved badges communicate a sense of professionalism and confidence in addition to clearly identifying your personnel, Each badge is custom made to your specifications. Logos or special designs can be included. Choose from hundreds of color combinations and several types of fasteners. Custom fabricated sizes up to 2” x 4”. 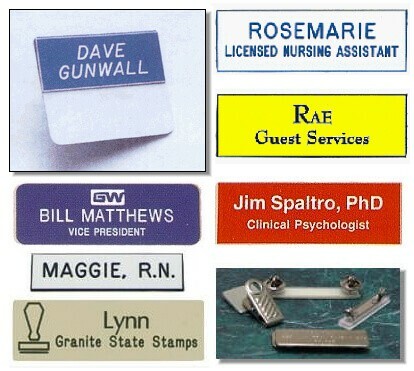 Choose from an assortment of badge attachments.